So it’s the Fourth Wednesday in December which means it’s my four month anniversary with The Fantasy Shop. I’ve decided that I want to contribute an article each week to our website. Every week I look over the shipping next week list (which you can get if you get on our Email list) and I decide which books I’m most excited for so I thought I’d share some of my thoughts with our lovely customers. The first book I want to talk about is Angel and Faith #5 from Dark Horse. Being a Child of the 90’s I grew up loving Buffy the Vampire Slayer. So I have been reading both BTVS Season 9 and Angel and Faith and I have to say I think Angel and Faith is the better book so far. With the Murder of Giles in BTVS Season 8 this book deals with the after effect of this on Angel (who murdered him) and Faith (who grew so close to Giles he left her everything he had). The last issue was very action packed starting off with a fight with vengeful vampires and full of mystery with Angel seemingly turning into Giles. I’m excited to see where this next issue takes us. Faith has always been my favorite slayer because she seems more relatable and human than Buffy. She does her best to do what she thinks is right and I always want to root for her. This week from DC I can’t wait to pick up Aquaman #4. Now for people who haven’t been reading the series this might come as a surprise to you but I believe Geoff Johns has completely made Aquaman an amazing superhero. Since his work on Blackest Night I’ve been really interested in Aquaman but not just because Johns knows how to write him but because of a character that in my option is a breakout star from Blackest Night. Mera is a strong and loving woman who supports her husband and makes him a better hero. She is also really able to hold her own in a fight. The series so far is dealing with the mysterious monsters that are attacking humanity from someplace in the ocean. This last issue ending with Aquaman and Mera discovering where the creatures were from “The Trench” and so like superheroes do they jumped down into the ocean and are swimming to discover what in the world is going on. The story is interesting, funny, and smart it keeps me wanting more every month. It’s going to be great to see where John’s takes this story and I’m excited to see exactly what this Trench is. IDW has always impressed me with the variety of books that they put out. 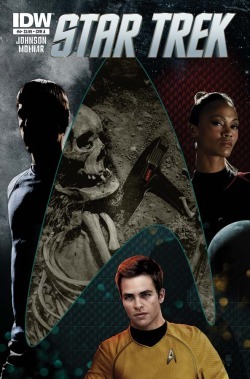 This week Star Trek #4 is the book I want to sit and read the moment I see it. Since this comic is based off of J.J Abrams movie it’s are really great supplement material to help us fans who want more but hate waiting for a sequel. I love how the books have very short story arcs. The first two issues were one and the next two are another. It’s a lot more episodic than a regular comic book. I get a whole story in just two months instead of the normal five to six. I think this is the most fulfilling book I’m reading right now because of how quickly they finish storylines. 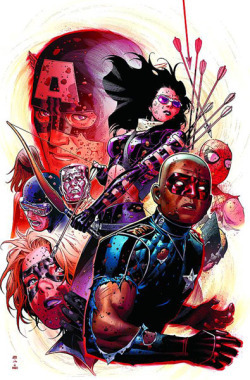 The last book I want to talk about is Avengers Children’s Crusade #8. I just recently read the other issues of this book and all I could think was why the heck did it take me so long do so. First off it’s amazing, second it deals with such a huge event that affected the whole marvel universe (M day), and third it’s going to be one of the main lead up books to the X-Men verses Avengers even. It makes me sad that Allan Heinberg is so busy because I want him to write this all the time. He just knows how to write a teenage team as teenagers but not annoying. The last issue Dr. Doom, Wiccan and the Scarlet Witch were trying to give all of the depowered mutants their powers back and because of Patriots attempt of stopping them Doom has been given all of Wanda’s powers and is dressed all in white, healed and calling himself Victor. This book will have such a huge influence on the Marvel Universe after it is finished each issue is just never a waste of anything and it’s so great to have a book like that. Other books I’m looking forward to this week are Flash #4, Green Lantern New Guardians #4, Teen Titans #4, Ulimate X-Men, X-Men Legacy, and Uncanny X-men. If you guys want to hear why come visit me at the South County Store and I’d love to talk to you about what books excite you as well. If you can’t see me all of our clerks are great resources to talk to. I hope you liked my article and have a Happy New Year everyone.